A Nervous Splendor: Vienna 1888/1889, Frederic Morton, Little Brown Company, 1979, ISBN 9780316585323, 340pp. Bob Gore loaned this book to us in response to our plea for information about Austria and Switzerland. I was unsure of its interest for me at first, fearing that it might be little more than a condensed version of the scholarly work that kept popping up on all my book searches called The History of the Hapsburgs from way too long ago until 1918 (I paraphrase from memory). On the other hand, I had to admire an historian who limited himself not only to one city, but to a nine month time period. That’s like having a jazz musician limit herself to a ten-second solo. The limitations paid off, however, mainly because Morton’s selection of those few months enable him to cover a highly significant moment of Austrian history, but also to bring in a cast of characters that would normally have been only peripheral to the usual story of history. The reader, thus, gets a sense of not only the political tenor of the times, but also an insight into the medical (through the description of a young Sigmund Freud), the literary (Theodor Herzl and Arthur Schnitzler), the musical (Johannes Brahams and Anton Bruckner), the artistry (Gustav Klimt), and the everyday (a street-player known as the King of Birds). History is not a novel, so these lives do not intertwine as they would in a fiction, but each does bring an expanded understanding of what Vienna was like. The central “story” to the book is Crown Prince Rudolf and his frustration with being heir to the Austrian empire with nothing to do except ceremonial duties. Morton depicts Rudolf as a freethinker who might have changed the course of history had it not been for Emperor Franz Joseph’s wonderful health. Instead, Rudolf, in the course of nine months, goes from being a revolutionary who must have his writing published under someone else’s name to a drug-addled conspirator, who, with his nubile, fashion-setting mistress, decides to commit double-suicide. The tragedy is heir-apparent (pause for groans to subside), as Rudolf would have likely been much more palatable to the subjects of Sarajevo than Franz Ferdinand. 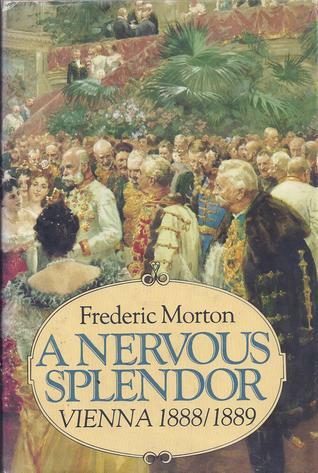 I must admit to being fairly ignorant of European history (okay, I was schooled in America–I’m pretty ignorant of history, per se), so when Morton drops the fact halfway through A Nervous Splendor that Rudolf commits suicide, I was surprised. But such is the difference between history and fiction. Morton expects the reader to already be aware of the high points in his narrative, and seeks to illustrate the base of those icebergs (this is also why I don’t feel guilty for discussing the suicide myself). He succeeds, and I now am quite interested in his follow-up to this book, a volume called Thunder at Twilight which depicts Austria right before World War I.